The bad news: a donation can placed on the counter of a store in Mandaluyong City was stolen by a thief. The good news: the thief was captured on video doing the criminal act. A CCTV camera installed within the store showed a woman in her 40s or 50s stealing the donation can. The incident happened at a branch of Fax Parcel Print located inside SM Megamall. 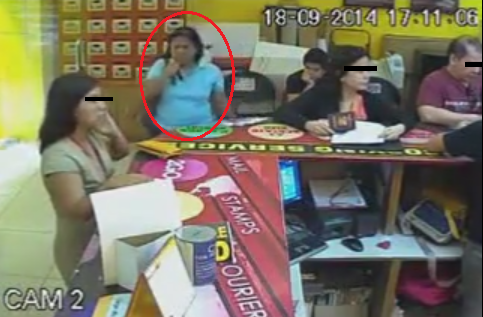 In the two-minute video, a woman carrying a shoulder bag and a gift bag entered the store. The woman immediately headed to the portion of the counter where the donation can was located. She then placed the gift bag she was carrying on top of the counter to conceal the can from other customers within the store. Moments later, using a brown jacket, the woman covered the can, grabbed it, and walked out of the store. Kurt Perez who works at the store posted the video on Facebook. According to Perez, they reviewed the tape taken by their CCTV cameras when they found out that the donation can was missing. That's when they saw that it was stolen by a thief. Placing donation boxes and cans inside stores in the Philippines is a common practice. Most of the donations collected from these cans and boxes are for charities like Gawad Kalinga and organizations like the Red Cross. It's saddening to think that some people are desperate enough to steal these donations for their own personal use.